This document describes the process of configuring ActiveMQ for availability and performance monitoring with ATSD. Log in to the ActiveMQ server via SSH. Change to the ActiveMQ installation directory. See Aggregation Log Filter for additional configuration options. 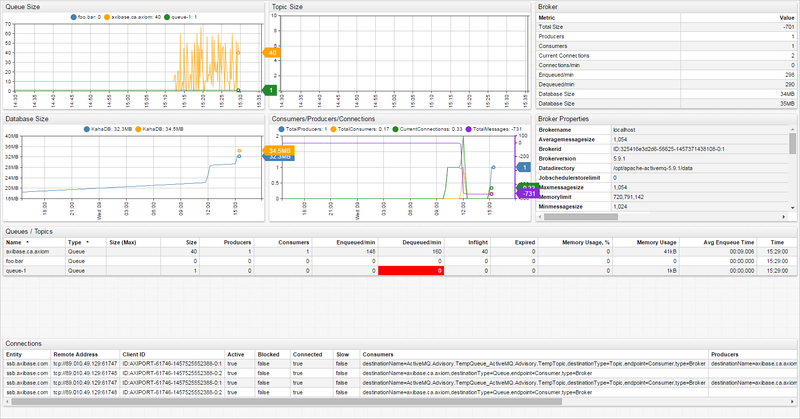 Modify JMX settings in the ActiveMQ JVM launch options. Search for the ACTIVEMQ_SUNJMX_START setting and replace activemq_hostname with the full hostname or IP address of the ActiveMQ server. This is the same hostname that Axibase Collector uses when connecting to ActiveMQ server. 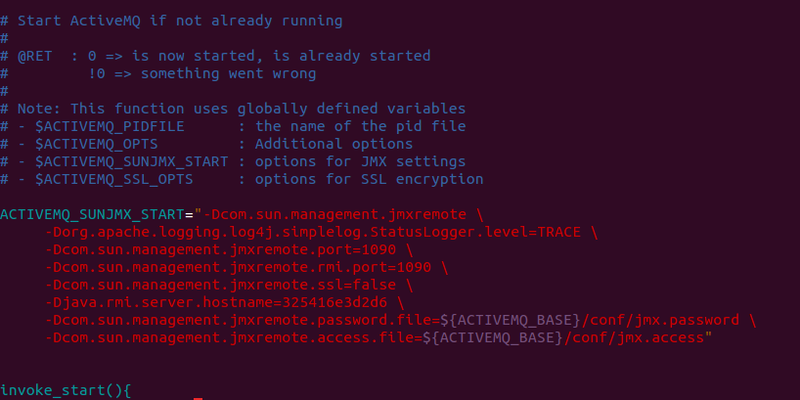 Modify JMX security credential files in ./conf directory. # The "monitorRole" role password is "abc123". Log in to the ATSD web interface at https://atsd_hostname:8443. Locate the ActiveMQ host in the Entities list or enter the entity name in the Search Bar above the list. Click the Portal icon next to the host. Log in to Axibase Collector via SSH and verify that the ActiveMQ server is reachable on activemq_hostname (see Step 1). If the activemq_hostname cannot be resolved, add it to /etc/hosts manually. Log in to Axibase Collector at https://collector_hostname:9443. 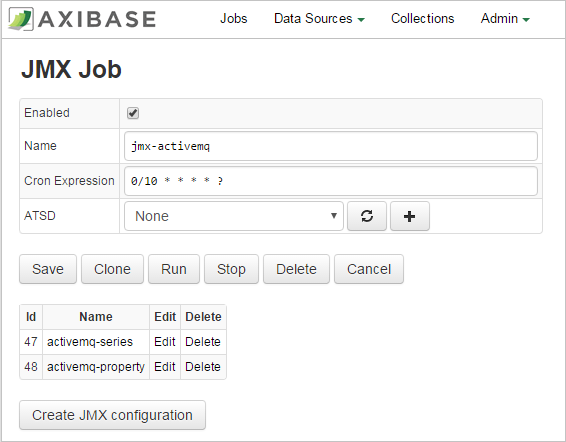 From the Jobs page, locate the jmx-activemq job. On the JMX Job page, enable collection with the Enabled checkbox, click Save. Adjust the cron expression if needed. By default, Collector executes the job every ten seconds. For more information on cron expressions, see Scheduling. Host: ActiveMQ hostname. Must be the same as the activemq_hostname. User Name: JMX user name such as monitorRole. Read-only permissions are sufficient. Password: Password for JMX user. Entity: Optionally, specify the output of the hostname command on the ActiveMQ server if the hostname differs from activemq_hostname (for example, if activemq_hostname represents a fully-qualified name). Other parameters are optional. For more information on JMX configuration, see JMX. Click Test to validate the configuration. If the existing configuration passes, this indicates that there are no errors or empty fields in the test results. From the table on the JMX Job page, click Edit next to the activemq-property configuration. Set Host, Port, User Name, Password, and Entity fields as described in the previous section. Click Test to validate the configuration. Log in to ATSD web interface at https://atsd_hostname:8443. Locate the ActiveMQ host in the Entities list or enter the name in Search Bar above the list.